Those who know me well, know I’m allergic to everything that once swam in the sea. 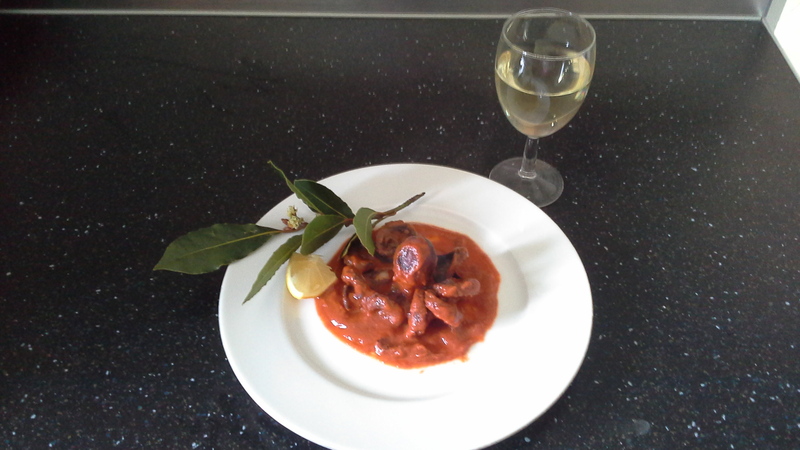 So, when Angela suggested ‘Polipo al sugo’, Octopus in a tomato sauce, for our next cookery lesson, I was a little hesitant. But, ‘when in Puglia, do as they do,’ I thought and we all got stuck in; well, nearly all of us! 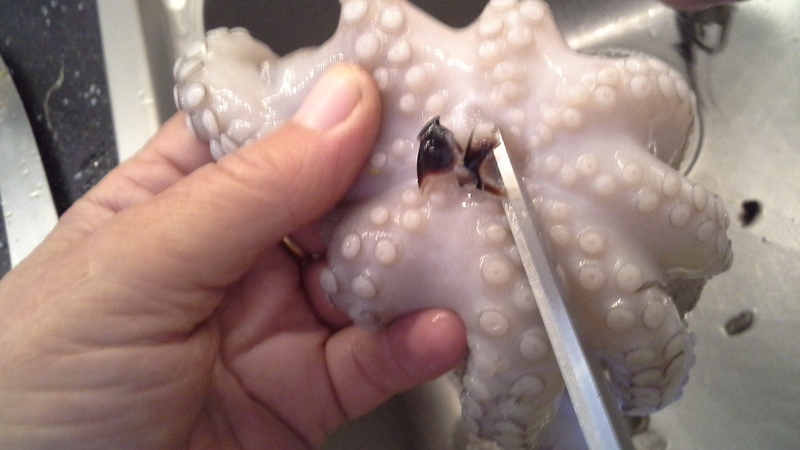 Angela’s first ‘top tip’, always buy fresh octopus and freeze it, then defrost before cooking. This tenderises it by breaking down the molecules and cuts the cooking time down by half. First task, the ‘deep’ clean operation and this week I thought I would I take some action shots of ‘cooking like a local’ in progress. As I returned with my camera and took a closer look at the technique Angela was using, I squealed like a little girl and leaped to the far side of the kitchen, as she gouged its mouth out with a pair of scissors. OMG! I wasn’t expecting that! The whole mouth just popped out! Next were the eyes to go, these were a little bit trickier and required a bit more care, otherwise you could be squirted with black ink. “Attentioni”, Angela yelled as one popped! Next, the intestines. Fortunately, these were already clean, phew! “OK, chi volete provare!” – who wants to have a go! Um, ‘I’ll let the others tackle this one!’ I thought. Four large octopuses cleaned and ready for cooking. A large frying pan with olive oil, garlic and an onion was heated and sautéed for a couple of minutes. Then, the octopuses were gently added, along with a jar of passata. I asked Angela, “How do you know when it’s ready?” and she demonstrated with a fork. If the fork goes in and out of the octopus easily, it’s done! If the octopuses have been in the freezer, it takes about an hour, if they are fresh, they take much longer to tenderise. Sitting proudly on the plate with the reduced tomato sauce, ‘Polipo al sugo’ makes an elegant dish to serve to your friends. And apart from the initial cleaning process, it’s a very simple dish to prepare. Go on, have a go and impress your friends! Let me know how it turns out! Alla prossima! Until next time! ← Cooking like a local – Pugliese Style!